We loved this collection way back in 2012 (!) when we carried it as single scrapbook paper, and now it's back as a Deluxe Collector's Edition! 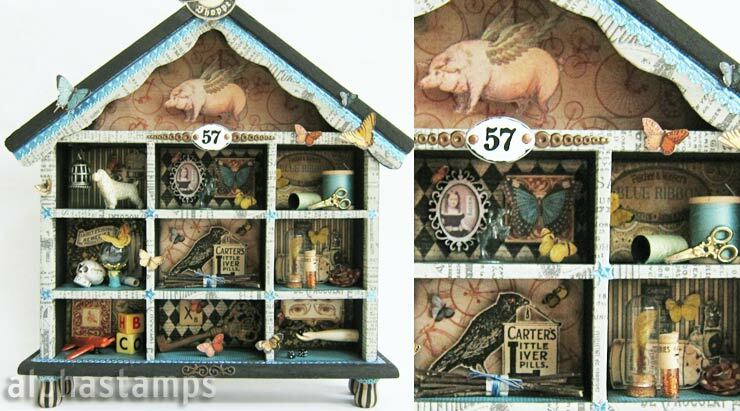 It's got tons of great imagery, from bees and butterflies to potion bottles... and flying pigs? - one 6" x 12" sheet of chipboard die-cuts. Hint: there are tons of photos of the individual pages above... just click the right arrow on the little thumbnails under the main photo to see more. Design Team Member Kristin Batsel made a Cabinet of Curiosities (see the wide photo below). More info in the blog and/or see the supply list.